Susanka stresses creating spaces that suit what you really do. A formal dining room may seem elegant, but unless you’re throwing dinner parties on a regular basis, it’s a waste of space. Most of my friends who live in homes with formal dining rooms end up turning them into home offices or game rooms. We moved to a new (to us) place about 12 years ago, which more than doubled our living space. Going from an 800 square-foot two-bedroom home to one with over 2000, we were stunned. My wife and I were forced to look at things differently. We gave serious thought and reflected on how our family lives, and came up with a plan that utilizes space in a way that most reflects our values. This is also manifested in our former garage, which hasn’t had a car in it in 11 years. That’s because my garage is a blacksmith and woodworking shop on one side, and canoe, kayak, and bike storage on the other side. Now I understand the allure of putting cars in a garage. If I were lucky enough to have a 4-car garage I would definitely put our cars to bed under a roof, but city life means compromises. Which to give up? Obviously we made the right decision…for our family. 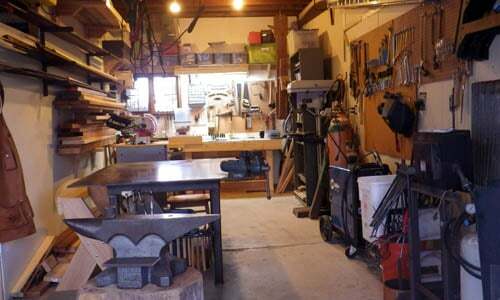 If you’ve ever thought about turning your garage into a blacksmithing or woodworking shop (or both), below I offer some thoughts on how to do it, as well as why you should consider making your dream a reality.